Don’t forget to clean your fence! Keeping your fence clean and maintained can be tough to keep up with. Different fences, including vinyl, chain link, wood, steel, and aluminum fences require certain cleaning methods in order to maintain them. The following are the processes for cleaning and maintaining 3 common types of fencing. To keep your vinyl fence looking new, you should be cleaning it every 3-6 months with water, soap or vinyl cleaning solution, soft cloth rags, and soft brushes for tougher stains. Whether you’re using cleaning solution or soapy water, you’ll want to concentrate on spraying or wiping down the visibly dirty areas of the fence—simply spraying down the fence with a hose won’t remove the grass and dirt stains, weathering, and chalk buildup that can wind up making your fence look dingy over time. Some things to avoid when it comes to caring for your vinyl fence will help keep it looking new. First, you should never paint your vinyl fence. Don’t place a barbeque grill next to the fence, as it could cause smoke stains. Screwing attachments to a vinyl fence or hanging heavy lawn ornaments and plants on it could cause damage or even void your warranty. Wood fences are a bit more difficult to wash and maintain than vinyl fences, but you only need to clean them every 3-5 years. In order to protect your grass, you may want to lay down plastic sheets before getting started. You can choose to use either a wood cleaning solution from the hardware store or a bleach solution (1 part bleach to 2 parts water) applied to the fence. Allow the solution to sit until you notice the fence looking brighter and cleaner, then rinse it off with a water hose—or a power hose about 12 inches from the fence on the widest setting if there are still some tough stains. You can repeat this process until your fence is looking spotless! Following the cleaning process, you’ll want to use a stain or wood sealant to keep your fence looking newer, longer—but do not use paint. This process will help keep your fence looking clean and your outdoor area looking beautiful, as wood fences can be prone to graying, fading, or even the accumulation of mold. Cleaning metal fences is simple, and should be done yearly or as needed. 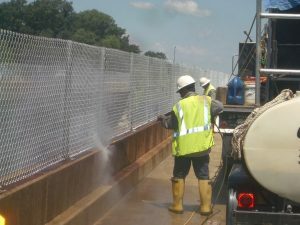 A chain link, steel, or aluminum fence can often be cleaned by simply spraying it off with a hose, but tough stains can be cleaned with a soft scrub brush and a bucket of soapy water. Cleaning this way once a year will keep your metal fence from looking rusted! This entry was posted on Friday, May 25th, 2018 at 4:09 pm. Both comments and pings are currently closed.